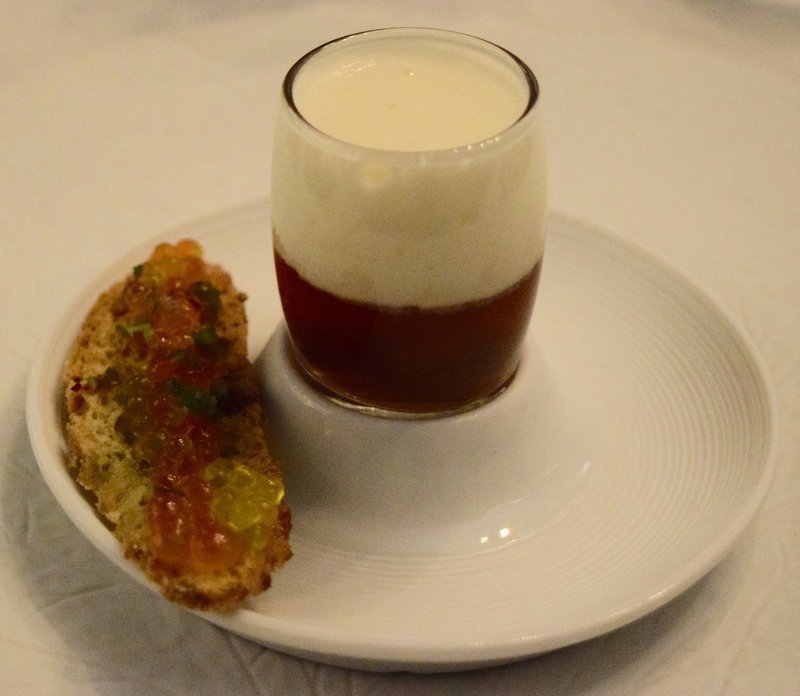 I have just returned from a fantastic holiday in Madrid and felt compelled to write about an amazing meal. To re -phrase a well known tagline ” Probably the best meal in the World” at least from my gastronomic experiences. 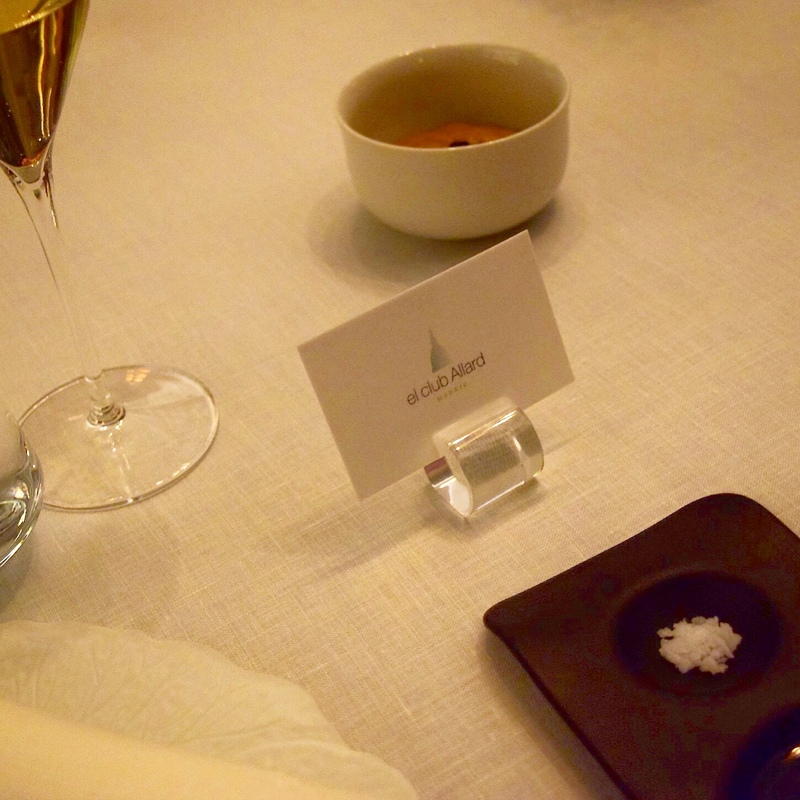 We visited El Club Allard, a two Michelin Star restaurant on The Plaza de Espana near the Egyptian Debod Temple in Madrid. The Head Chef, Maria Marte originally came to Spain from the Dominican Republic and started as a dishwasher. She worked hard culminating in becoming Head Chef achieving a second Michelin Star four years ago .We entered through the large wrought iron door of a grand Modernist building and were greeted by a doorman who escorted us up the beautiful marble staircase to the entrance. The restaurant setting is impressive- tall ceilings, large windows, antique mirrors & only 11 tables- the perfect setting and its ambience adds to the anticipation of what is to follow. There is a choice of 3 tasting menus: Rendevous, Seduction or Revolution (10, 12 or 14 courses) with each course revealed as it is served. We opted for the Revolution menu and our personal waiter who had spent two years in London explained each course brilliantly. 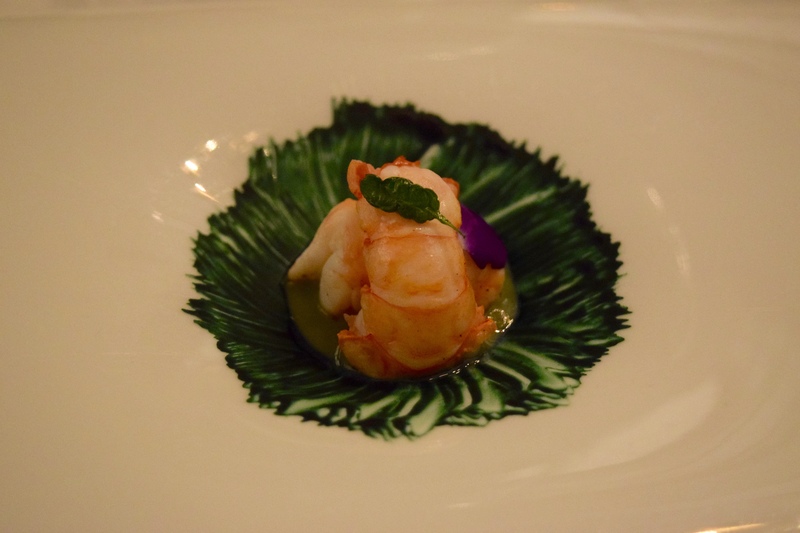 The creative and innovative food has Hispanic, South American, Japanese and Spanish influences. 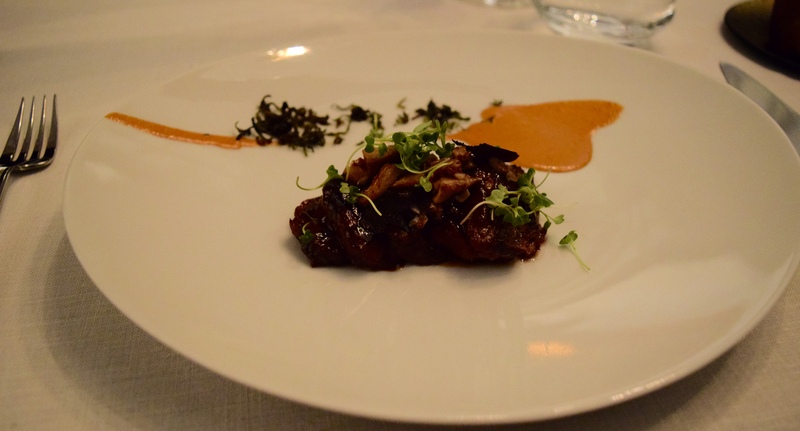 They do a vegetarian tasting menu and will accommodate any dietary restrictions. You are invited to start the experience by eating your place card, served with a warm caramelised onion dip that is absolutely delicious and a fun way to start. Each course is presented in a very innovative way – from the plates, the appearance, amazing aromas, incredible ingredients and taste combinations. Course No. 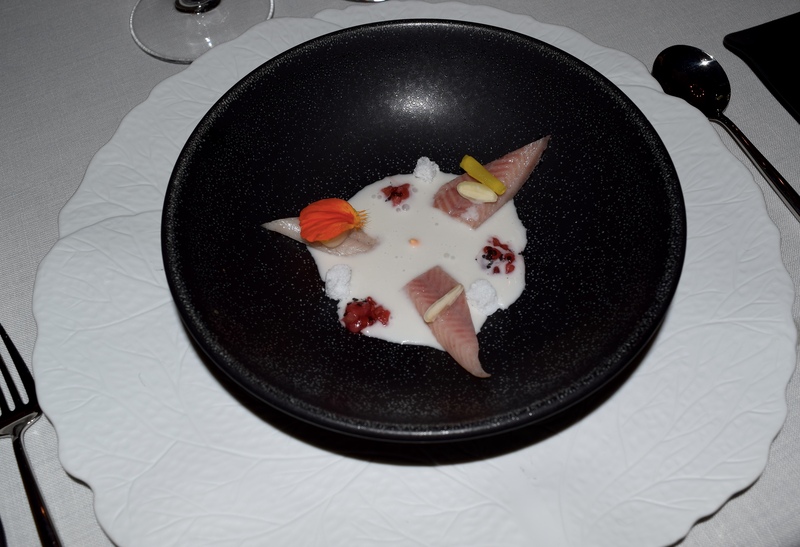 1: Smoked eel, with a smokey,slightly hot South American rocoto chilli, white coconut snow & coconut milk. Brilliant combinations of flavours & textures. Course No. 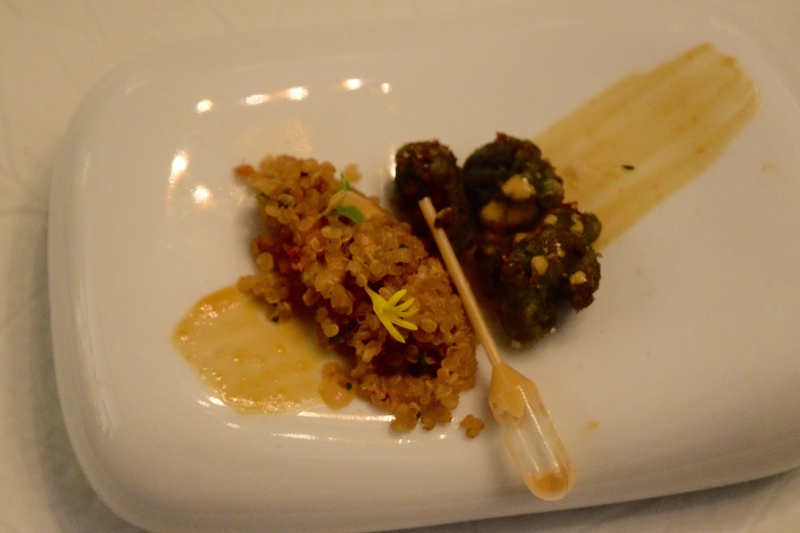 2 you pipetted the sauce on to flavoured quinoa and sea urchin, which had a savoury taste and nutty yet soft texture. Course No. 3 was a warm shot of white foamy asparagus and butterfish accompanied by a savoury delicious seaweed toast topped with salmon roe. 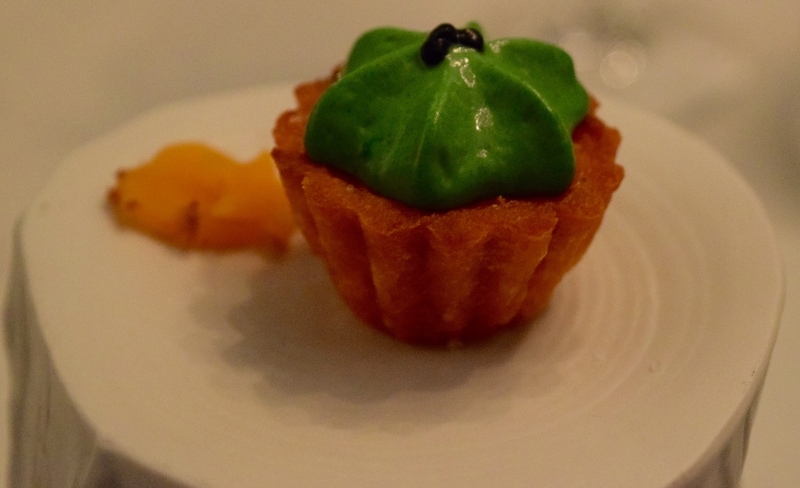 Course No.4 was an innovative savoury cupcake made of yuca topped with an egg & truffle ‘buttercream’ and a roasted pumpkin slither that you added on top and ate in one mouthful – fantastic! 4: Looks sweet tastes savoury! Course No. 5 a little succulent crayfish with a subtle sea garlic sauce -sublime! Course No.6 was usuzukuri -thinly sliced sashimi of white fish topped with avocado cream & pico de gallo (image at the top of the post). Course No. 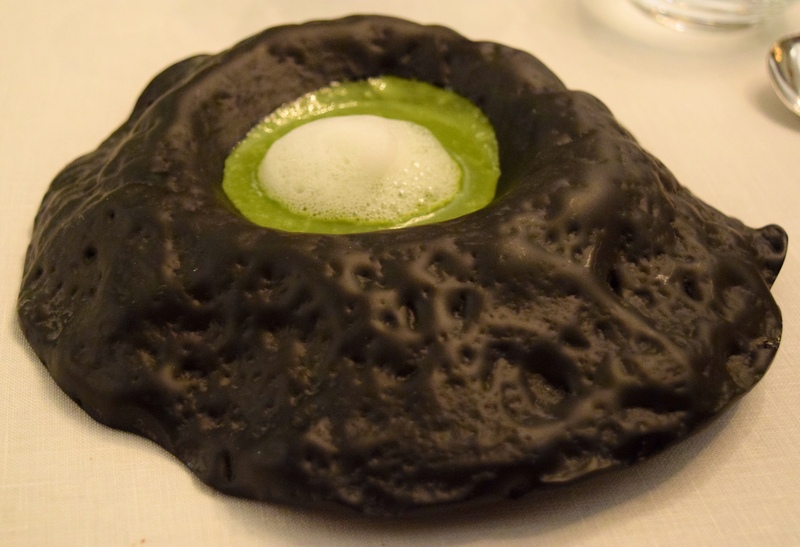 7 had the most unusual plate, a black volcano like holder with an indent at the top holding a cabbage cream with cockles and topped with a lemon foam. Course No. 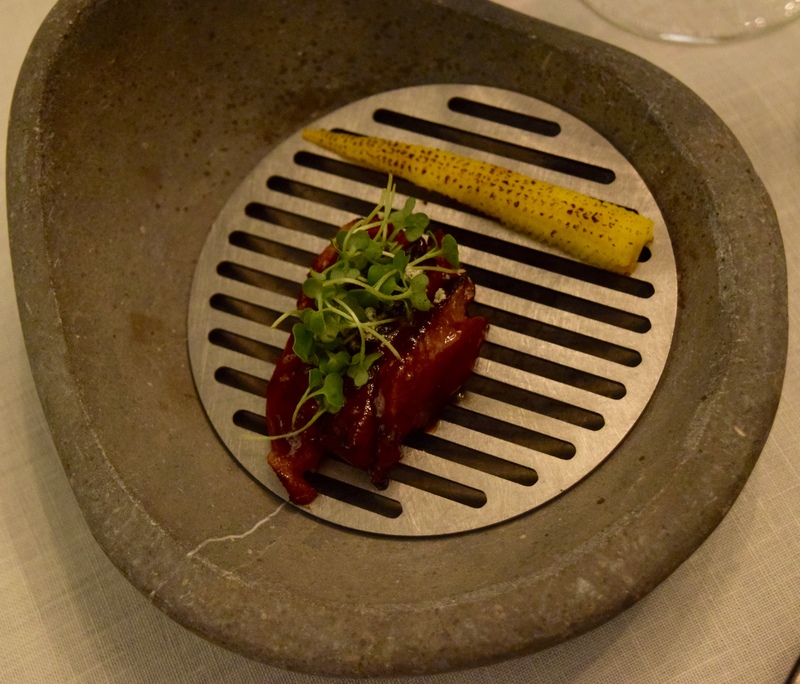 8 was an individual mini BBQ with marinated succulent duck with a mini charred baby corn which was actually hand made using masa flour, the flour used in tortilla chips. 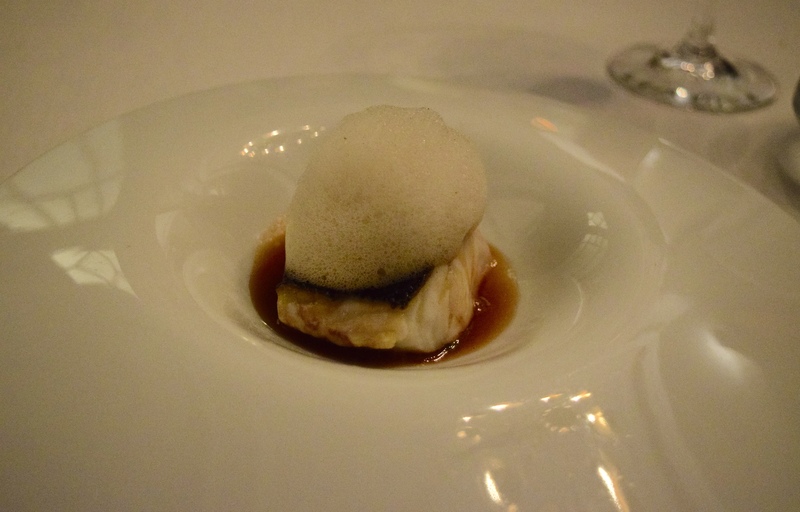 Course No.9 was sea bass with a Tsuyu No Moto, a Japanese seasoned soy sauce concentrate. Almost two hours in we got to the meat – course No. 10 which was the most tender, succulent Wagyu beef ‘Picanha’ , a cut popular in Brazil from the rump. Wagyu beef is massaged & fed beer & sake and with lots of fat marbling, makes it incredibly tender that melts in the mouth. We then had a palate cleanser ( course No. 11) of thin crispy wafer of hibiscus flower topped with a Pisco sour sorbet, a Peruvian cocktail, that refreshed us ready for desserts. The first dessert was a green coloured white chocolate miniature pear which you ate whole. You crunched through the crisp shell to a melting centre of pineapple. This was followed by the final dessert of intense dark chocolate clusters with chocolate soil, white chocolate cream and a black olive crisp wafer, the salty taste enhanced and complemented the rich dark chocolate. There was also small mint sponges that married all the flavours together. As it was my birthday I was presented with a surprise extra course of strawberry cream in thin white chocolate shells. 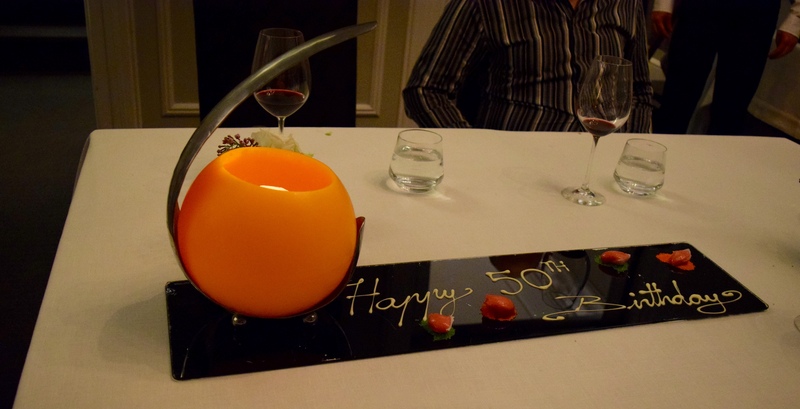 I cannot add any more superlatives – simply the best meal I have ever experienced. The most foodie way to celebrate my birthday. Comida Increible El Club Allard! Mouth waveringly beautiful photos, this sounds heavenly! Most intrigued by savoury cupcakes with egg and truffle buttercream! Hi E it was incredible, could not use a flash so photos a little dark. The edible rice paper place card dipped into a warm rich caramelised onion pot was not gimmicy just delicious.The cupcake was more format than taste/texture- a crispy shell made of yuca & maybe some masa flour with a bright green smooth cream that must have used chlorophyll- parsley to get such a vibrant colour . 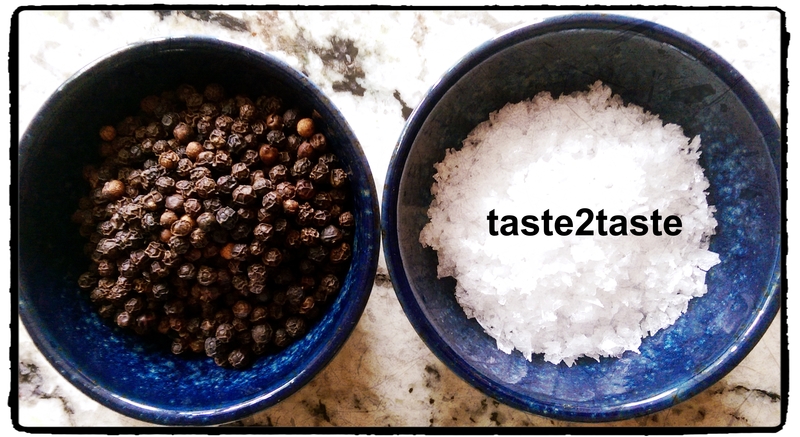 The taste was rich & ‘truffley’. There was a sweet roasted pumpkin that you added on top. Looks gorgeous, too good to eat. The hibiscus flower palate cleanser sounds most interesting! Definite food as theatre. Thanks for your comment! Definitely theatre with a lot of thought put into selecting & combining the ingredients, preparing or cooking them and the presentation on some great crockery in a grand setting. Fantastic experience!